The Painted Man (aka The Warded Man in the USA) is the first book of The Demon Trilogy and is this year's big debut fantasy series from HarperCollins Voyager. I hadn't heard of it prior to receiving the review copy, which is a shame as it's an excellent debut novel that can stand alongside a number of other recent high-profile debuts quite comfortably. I enjoyed it more than Ruckley's Winterbirth, and at about the same quality of enjoyment as Abercrombie's The Blade Itself, for example. 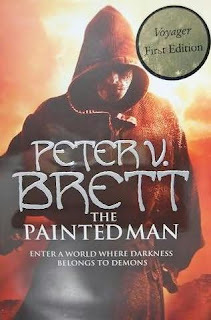 The Painted Man is set in a world where people live in terror of the night. When the sun goes down, demons - or 'corelings' - from below the ground emerge on the surface to kill and feast on human flesh until morning comes. Humanity has discovered powerful defensive magic in the form of wards which can protect their homes, or even patches of ground, but this magic is not always perfect and the different varieties of demons have different ways to overcome the wards. Eleven-year-old Arlen lives on his parent's farmstead, but a coreling attack leaves his family decimated and many friends and neighbours dead. Despising his father's cowardice for getting his mother killed, Arlen runs away from home, surviving by carving wards into the dirt every night. Eventually he reaches safety in a big city and finds a new, loving family...but memories of his childhood continue to haunt him and he becomes obsessed with the idea of leading humanity to an ultimate victory over the demons, to stop cowering in fear behind walls and wards and go on the offensive. Meanwhile, thirteen-year-old Leesha is set up for a prosperous life, ready to inherit her father's business and marry one of the most popular boys in her village. However, her mother's bitterness and her betrothed's error in judgement instead leads her on a very different path as she learns the arts of herblore and healing from the town's wise woman. An entire town is obliterated by a coreling attack, leaving only a single survivor: a three-year-old boy named Rojer. A visiting Jongleur decides to take Rojer her his wing as his apprentice, setting them both on an dangerous path. The Painted Man is a page-turning book. Whilst at heart it doesn't necessarily journey too far from established tropes (it even starts in a village), it mixes them up nicely. The land of Thesa owes as much to Westerns in its scenery than to traditional epic fantasy, whilst the ward magic is notably different to the wizards 'n' warlocks found in other works. The notions of paranoia and fear, and the price of overcoming that, are also explored in-depth. The characters are likable and interesting. To some extent they follow the traditional 'callow youths come good' model, but the central character of Arlen takes a rather different course and there are hints that his dark and dangerous journey have left him a scarred and bitter character, for all that he finds some happiness at the end of the book. Brett's worldbuilding is pretty good, best exemplified when in a sequence lasting just a few chapters he takes Arlen into a burning desert kingdom and is able to paint it in as much detail and bring it to life as well as does the Free Cities and surrounding villages where the bulk of the narrative takes place. The plotting is also nicely done, with a huge amount of incident and character-building set up in the book, along with a reasonable amount of exposition. The book also comes to a definitive climax rather than a cliffhanger, meaning that whilst there is clearly plenty more to come you're not left hanging in mid-air for a year for the next instalment. The Painted Man (****) is a most enjoyable novel with an interesting premise that is well-developed and explored. I look forward to reading the sequels. The novel is available now from Voyager in the UK, and will be published (as The Warded Man) in the USA by Del Rey in March 2009. The author has a website here. I have this book on the stand...I actually mailed the author to send us a review copy, but sadly haven't had time to read it yet. Will do so shortly. I was given the book as a gift a few days ago and found that I had consumed it within a few evenings. I is such a gripping book that I had trouble putting it down at 2 each morning to go to sleep. I just cannot wait for the next in the series. I rarely buy books I haven't at least heard of, but got this on a whim. Read it in 2 days and absolutely loved it. Can't wait for more. Happy 30th Birthday Battlestar Galactica!